(30.12.2015) [results] Which location do you prefer for polls? (18.04.2016) [results] Which of these considered weapon suggestions would you like me to prioritize? (18.04.2016) [results] Which of these denied weapon suggestions would you want to see implemented after all? (30.04.2016) [results] !NEW! Which weapon types would you like to see added to Rimfire? Rimfire versions 2.2+ include a HugsLib 2.2.3+ Mod Settings Menu. The Milkor MGL was added after Zerg HiveMind requested a grenade launcher to be modded in. The H&K USC, Ruger PC-9 and Beretta CX-4 were added after Loki88 requested carbines. 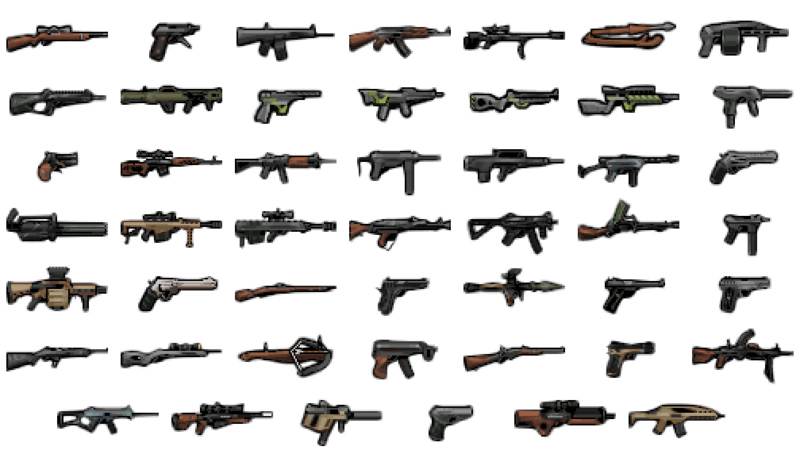 The AK-47 and RPG-7 were added after several requests and for being some of the most voted options in the 1st "Considered" poll. The Madsen LMG and Type 73 LMG were added for being the most voted option in the 1st "Considered" poll. The language selection part of the MCM was added after Grimandevil requested real-life gun names. The categorization part of the MCM was added after Kittaye requested such functionality. The S&W Model 500 and Barrett M82A1 were added after Mr. Picard requested a .500 Magnum and Barrett .50 Cal. The Ruger 10/22 was added after Austupaio requested a 10/22. The Rheinmetall MG60 was added after Iwillbenicetou requested an MG60. The Ruger Mk III Standard, Ruger 10/22 and Spencer Repeating Rifle were added after several requests for Rimfire calibre weaponry and after it being the top voted option in the 2nd "Denied" poll. Originally inspired by Guns+ Alpha 8 by Hunter712. Guns, I can't get enough guns! Indeed it does look nice, I must try it! Yeeehaw, more guns! Guns are funs. looks pretty (and pretty vanilla), but why the "Vintovka Mosina" is the only gun with relief wood-part? I used the Guns+ colours for most guns, and took a look at the Lee-Enfield for the Mosin's texture. Guns+ doesn't have highlights on the wooden parts of its guns, so I didn't add them. I'll add them on the Galil and WA-2000 in the next version - that would look better indeed, thanks for pointing it out. At every commenter so far: Thanks for checking out my mod! If you have any suggestions, feel free to leave them. I've been playtesting the mod for a while today and I feel some gun sounds might be too loud, especially the Scout and WA-2000. If you would like a lower volume version of the mod, just ask. Another thing I was thinking about was making a version with guns in the exact vanilla style (without anti-aliasing and transparency). If that's something you're interested in please leave a comment. Worked on a Combat Realism balanced version. It's up at the second dropbox download button at the moment. Please note this version REQUIRES Combat Realism to work. Please also note that you will have to deactivate the standard 1.0 version of Rimfire. Now to update the graphical style to fit Alpha 9! Expect a new version Soon(tm). My gun collection thanks you! Day 1 after Alpha 9, the gun graphics are close to done. I'm still working on the XML files, and I'll have to fix some sprites from looking weird in-game. Day 2 after Alpha 9, cleaning up the graphics and colourswapping them to fit eachother better. It seems like Rimworld vanilla guns use a 48x48 or 32x32 canvas, from what I've seen in-game. When is the A9 graphics pack there so I can compare? Eugh. Alpha 9 update is out! How beautiful it is with these fancy new graphics! Are you someone who draw dots professionally? Yup, that's me - if you want to see more, I've got a DeviantART gallery. This mod is giving the same error on world gen as Right Tool For The Job.